I was sad when it was announced that Iron Cupcake: Earth was no more. It was a significant factor in my getting seriously interested in pastry, leading me to experiment with recipes and learn how to make a real buttercream. It was on hiatus for a while as its fate was being determined, and I really missed the challenge and fun of making creative cupcakes at home. Luckily, there’s a new cupcake competition starting this month, and it’s called Mystery Box. I happened to come across a tweet announcing it while I was coincidentally thinking about searching for cupcake inspiration. The timing couldn’t be better, and the first month’s theme? Totally my thing. The theme for July 2010 is tea, something I enjoy immensely. I’m drinking tea right now, as a matter of fact. The hardest part was deciding on a tea to use – since you can only enter once per month, I knew I’d have to come up with something really good. I think I did just that. Everything is better with toasted coconut! I chose to flavor the cupcakes themselves with Thai tea, which is a fun choice because not only does Thai tea have an addictive, mysterious flavor (ingredients vary but there’s always some anise or other licorice-y spice in the mix, though it doesn’t taste like licorice), it also contains red and yellow dyes which make the tea bright orange when steeped. I hoped that both the color and flavor would carry over into the cupcakes once they were baked. As you can see, the color definitely shows. I’ve never seen cupcakes this color before! Mmmm sweet tangy spicy pineapple jamminess. I steeped the tea into the milk for my standard white cupcake recipe, using a lot to keep both the color and flavor strong. 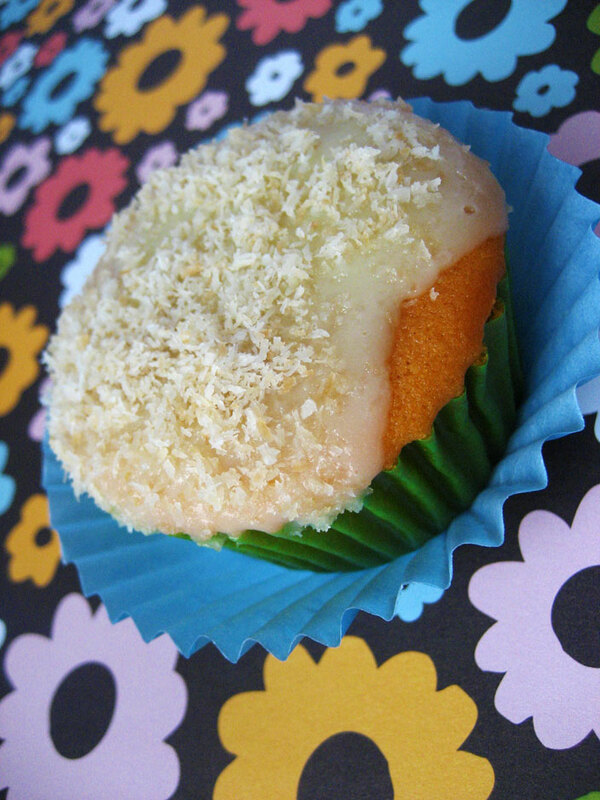 Happily, it worked perfectly and I was rewarded with bright orange, feathery-light cakes with a distinct Thai tea flavor. In keeping with the Thai theme, I filled the cupcakes with pineapple jam. Since it was so sweet, I added a little tang by way of a smidge of tamarind paste, and a kick of spice via a pinch of cayenne pepper. I made a white chocolate coconut ganache to frost them with, though I wasn’t quite patient enough with it and it ended up as more of a glaze. It’s very sweet, though, so I think the glaze-y amount is perfect. 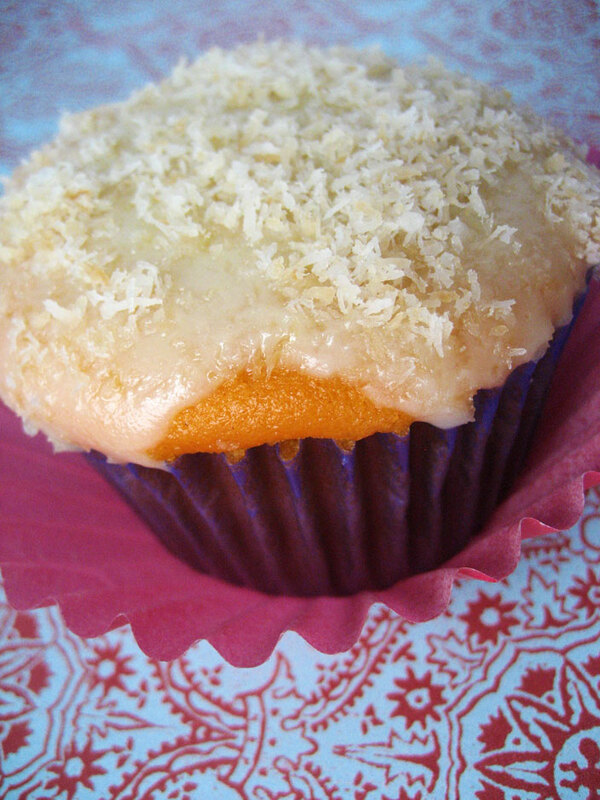 To emphasize the coconut flavor and add texture, I also sprinkled them with toasted shredded coconut. I wish you could taste this through the screen. Melt the chocolate over a double boiler. Heat the coconut milk until it steams, either in the microwave or in a saucepan. Pour the coconut milk into the white chocolate and gently whisk until fully emulsified. Chill until thick and almost set up, stirring a couple of times to ensure even thickening. Pour the milk into a small saucepan and heat until boiling little bubbles begin to form around the edge of the pan. Remove from heat and stir in the tea. Cover and let steep for 5-7 minutes. Strain thoroughly into a measuring cup, measuring out 1/2 cup. Cool thoroughly. Preheat the oven to 350F. Sift together the flour, baking powder and salt. Cream the butter and sugar until light and fluffy, then add the milk and dry mixture alternately in thirds, mixing slowly and scraping down the bowl between additions. Once everything is blended, add the egg whites and mix on a medium-high speed for no more than 2 minutes, until the batter becomes somewhat fluffy. Spoon into lined muffin tins and bake 15-20 minutes, until a toothpick inserted into the center of one comes out clean and before the cupcakes start to brown at all. Allow to cool fully before filling or frosting. Use a spatula to fold the pepper and tamarind thoroughly into the jam. Preheat the oven to 350F. 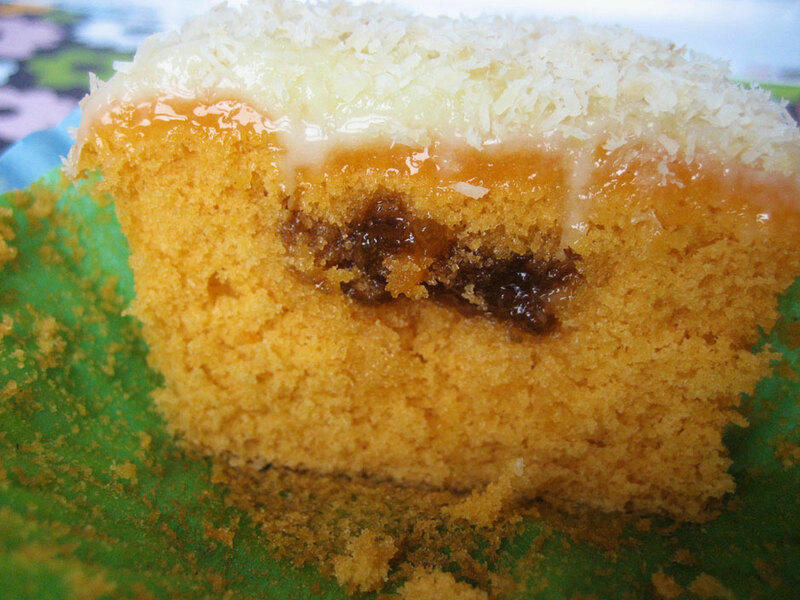 Spread the coconut out on a small baking sheet and bake for 5 minutes. Stir thoroughly to evenly distribute any browned areas, and continue toasting for another 3 minutes or so, until most of the coconut is a light golden brown. Set aside to cool. If you’re not used to working with extra soft cupcakes you might want to chill or even freeze them first to make the cake less crumbly. Use a small round cutter to punch out the middle of each cupcake, reserving the “lid” to each one and trimming them to 1/4″ thick. Place a blob of filling in each cupcake and replace the lid. Prepare the frosting in a piping bag. Pipe some onto each cupcake in any style you wish, or let it become more fluid and “flood” the tops (you’ll have some serious cleanup to do on the paper if you go this route but it’s awfully pretty). 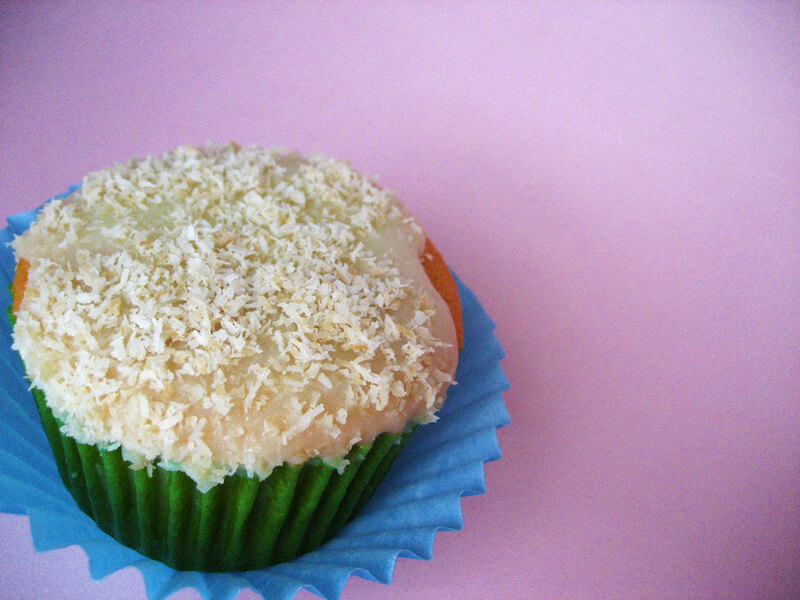 Top each cupcake with a generous amount of toasted coconut. Keeps well refrigerated up to a week or well-wrapped and frozen for a month or more. Allow to come to room temperature before devouring. Makes 10 full sized cupcakes. For all the info on Mystery Box, head on over to Sweetest Kitchen. How unique! I just might have to get my hands on some of this Thai tea you speak of. It sounds heavenly. pineapple, cayenne pepper, and tamarind paste? Yessssssss – I love it! Great recipe – I can’t wait to try it! 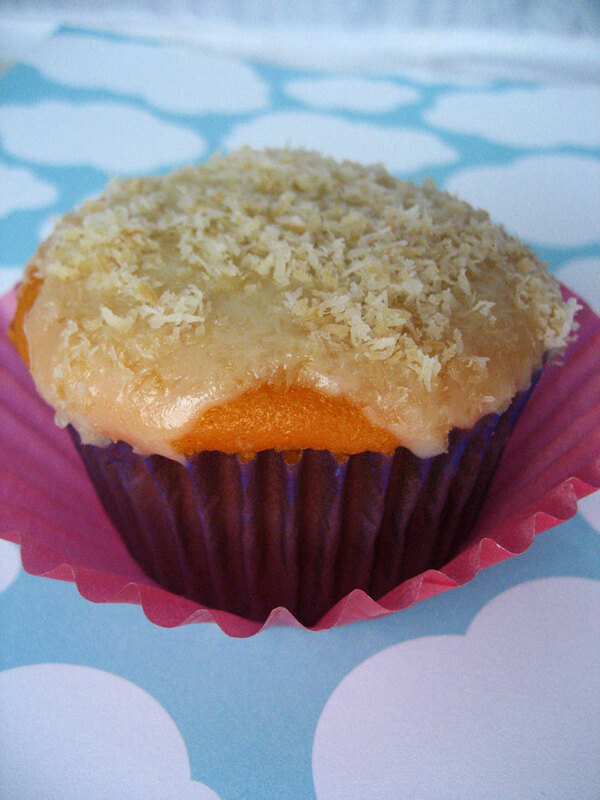 Wow, Thai tea cupcakes with coconut frosting. Girl you are after my own heart!!! I will have to make these! Thanks for stopping by my blog. and BTW you can use the seeds for the passion fruit in whatever your baking. They are neutral in flavor and make a nice contrast. Particularly in my passion fruit pudding. Have a smashing day!